Several summers ago, I made a brief attempt to approach the study of juvenile Lincoln’s vs. Swamp sparrows and noticed that the lore blocked all apparent avenues to field ID success. I sputtered in interest the following summer, and again wound up turned off/disinterested. 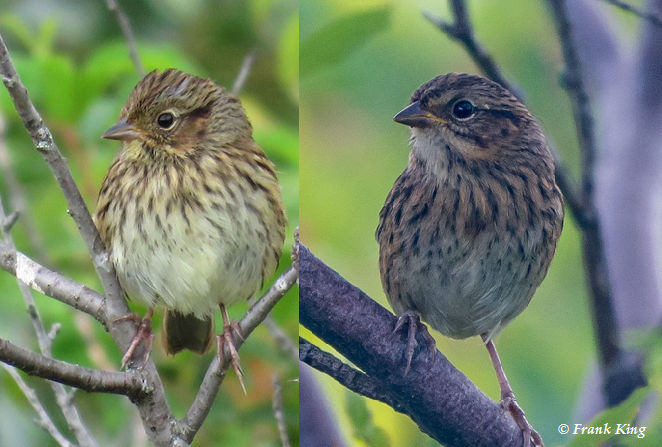 Just yesterday, however, I posted a photo of a juvenile Melospiza on my Facebook page, and a birder inquired “not LISP (Lincoln’s Sparrow) ?” My curiosity peaked, and I decided the following day (today, 24 July 2017) I would sit down and study the two. I poured myself some coffee, prepped a study soundtrack, and gathered all pertinent materials (Rimmer 1986, Pyle 2001, Sibley 2014). I opened up Flickr, and opened up both species’ photo pages in Migration Research Foundation, and the Macaulay Library. I set aside a notepad, two of my favourite pens, and was ready to give this identification dilemma another effort. For eastern and southern Ontario birders, juvenile Lincoln’s Sparrows are not often (or should I say, are rarely) encountered. This briefly-held plumage (July-August) occurs on this species’ natal grounds. Before Lincoln’s migrate south from their boggy, shrub wetland habitat throughout the boreal, they moult into first basic (first year; HY) plumage, which is more-or-less adult-like, and less likely to confuse birders. Swamp Sparrows are widespread throughout eastern and southern Ontario, and for birders spending time in the field during the summer months (July-August), they become acquainted with the juvenile plumage of this species. Eastern Ontario bogs — the wellspring of the dispersed? Curiously, the juvenile Lincoln’s Sparrow that we found at the Embrun Sewage Lagoons on 23 July 2017 was observed within reasonable distance to known breeding sites for this species. Take for example the following list of sites, followed by the distance (as the wee Lincoln’s flies). Larose Forest (probable locations within; 8-10 km), Morewood Bog (likely sites within; 12 km), Mer Bleue (known site; 25 km), and Alfred Bog (known site; 36 km). 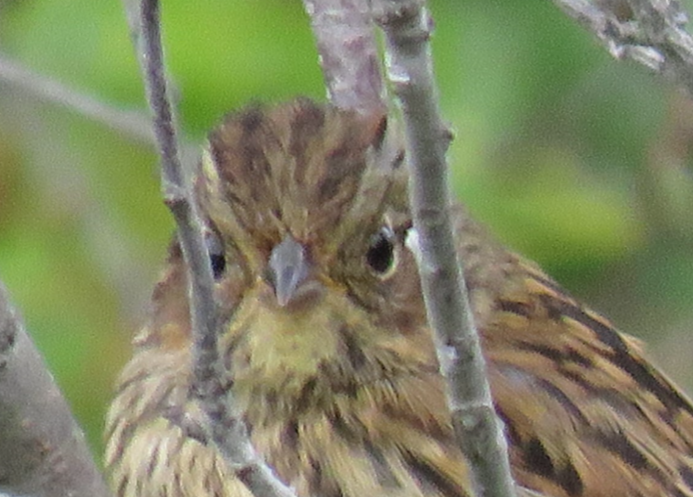 Therefore how does the above information affect the role of probability in making quick assessments of juvenile LISP/SWSP in the field whenever one birdwatches within the vicinity of eastern ON “bog country?” Is it a safe assumption to immediately label a mid-summer juvenile as a Swamp Sparrow, as I did on 23 July 2017, based on probability? Yesterday, the answer was yes, today the answer is no. The new solution is: if photographed, the bird can be identified by reviewing a suite of features, then combining the multiple parts of the analysis to form the whole picture of the bird. Can juveniles of the two be differentiated in the field, given short views through binoculars, sans review of photos afterward? Hard to say. For me, right now, I will lean on post-outing analysis to develop my Melospiza legs before brazen attempts at quick field identifications. For me, the gateway to learning more about this particular ID issue has only just re-opened…so, lot’s to learn! Head: For field ID, the greatest potential analytical weight stems from this region. On Lincoln’s, the crown detail is especially important. The crown is wholly brown to buffy-brown with distinct black streaking throughout. The median crown stripe being poorly-defined, blending, and showing low contrast with, the lateral crown stripes; the lateral crown stripes are grayish-brown and finely peppered with dark brown/blackish streaking. 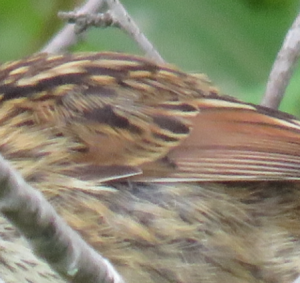 The edge to the upper portion of the supercilium averages more weakly defined than on Swamp Sparrow (personal observation). The moustachial and malar stripes appear, on average, less distinct, and slightly narrower compared to Swamp. The throat is often lightly streaked, especially along its edges. 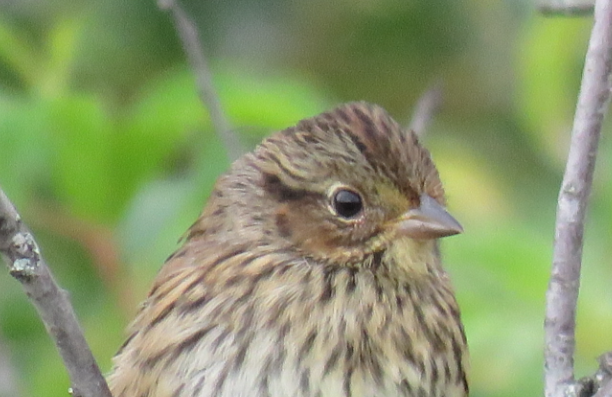 In its entirety, the head detail of a Lincoln’s Sparrow is quite muted overall compared to that of Swamp. There are less blackish tones throughout, and less sharply defined edges. The bird in its entirety: In my opinion, second-rung behind head detail. Take in the entire bird, as a single package. Lincoln’s appear more muted in colour, overall. They seem not as dark as Swamp Sparrows. They have less sharply-defined edges throughout the head; have less blackish (more brownish) detailing throughout, and average slightly duller chestnut edging throughout the flight feathers. Bill: Regardless of morphometric measurements, the importance for here is field applicability: is the difference perceptible. Photo after photo, the bill of a Lincoln’s is, by in large, perceptibly more delicate in build compared to Swamp. The bill averages slightly lighter in build, being more slender and narrow, and sometimes appears shorter; when viewing the ‘face’ in its entirety, this sets off a “cuter” expression. Greater coverts: Next in rung, in terms of field-applicability, is a look at the greater coverts. In Lincoln’s, each greater covert feather is dark, mainly blackish, with buff edging. This contrast averages slightly duller than the black-centered, bright buff edging seen with Swamp Sparrows. Note that this detail would be extremely difficult to correctly interpret without the use of photos of the specimen to examine once back home from the field. Underpart streaking: Lincoln’s average more heavily-streaked throughout the underside, especially along the sides of the breast and just below the edges of the chin, where dense streaks rain down upon a buffy bloom to the entire chest. There is a surprising degree of overlap in this feature, however, so it’s not at all bulletproof. Does the streaking to the underside of a Lincoln’s average slightly more extensive, marginally crisper, somewhat lighter in colour (lighter brown) than Swamp? I believe so, but these are averages, not absolutes. Legs and feet: As far as I know, this is not described, and may not even be a real thing, but. 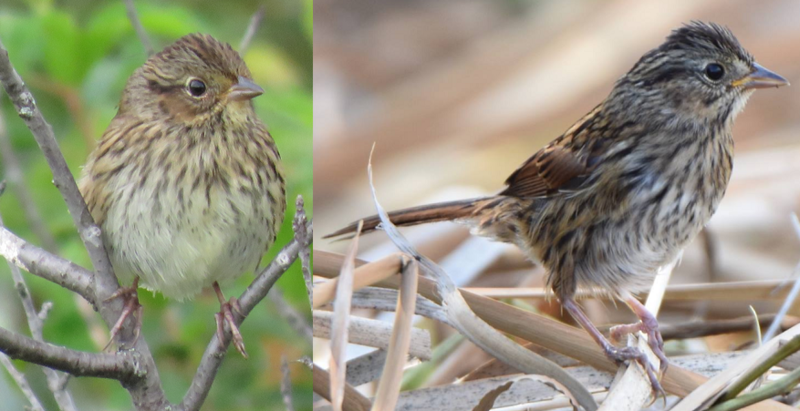 After reviewing hundreds of photos of both species, I noticed that the tarsi and feet of Lincoln’s Sparrows are daintier in build compared to Swamp. Buffy “bib”: This is a shared characteristic of juveniles of both species. My assumption is Lincoln’s are more likely to show consistency in this feature; Swamp possibly less likely. I wouldn’t give it much weight. It’s easy to see the classic adult Lincoln’s-buff in a juvenile bird, but know that it’s a shared character between the two species. Figure 1: Crown detail. Juvenile Lincoln’s Sparrow, Embrun Sewage Lagoons, Embrun, Ontario. 23 July 2017. Figure 2: Crown detail. 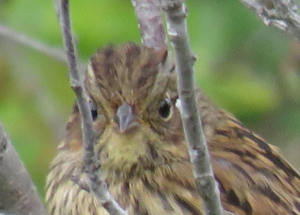 Juvenile Lincoln’s Sparrow, Embrun Sewage Lagoons, Embrun, Ontario. 23 July 2017. Figure 6: Bill detail. 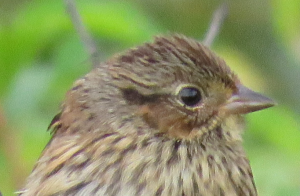 Juvenile Lincoln’s Sparrow, Embrun Sewage Lagoons, Embrun, Ontario. 23 July 2017. Figure 7: Bill detail. 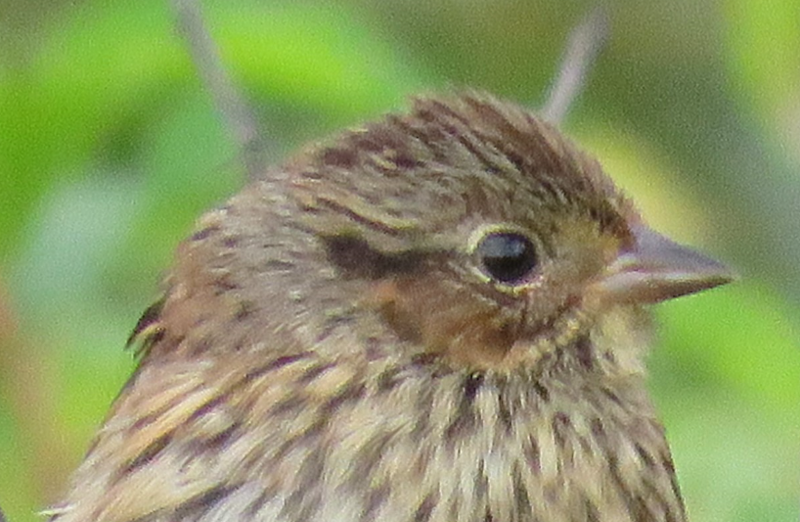 Juvenile Lincoln’s Sparrow, Embrun Sewage Lagoons, Embrun, Ontario. 23 July 2017. Figure 8: Greater covert detail. 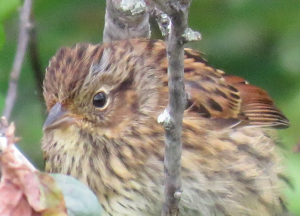 Juvenile Lincoln’s Sparrow, Embrun Sewage Lagoons, Embrun, Ontario. 23 July 2017. Separating juvenile Lincoln’s from Swamp is challenging and requires a multi-character analysis of plumage detail. Obtaining photos and reviewing them on a high-quality colour-corrected monitor is highly recommended. Thank you very much for reading all 1300 words of this web article! Thank you to Wayne Renaud and Frank King for the use of their photos of juvenile Swamp Sparrows. Thank-you to the following members of the Advanced Bird ID and Advanced Birding in Ontario page for weighing in on the ID online: Greg Neise, Victor Dillabaugh, Richard Beardon, Fred Urie, and Alison Jane Bentley. Pyle, P. 1997. Identification guide to North American Birds. 2nd printing. Part I, Columbidae to Plocidae. Slate Creek Press, Bolinas CA. Rimmer, C.C. 1986. Identification of juvenile Lincoln’s and Swamp Sparrows. 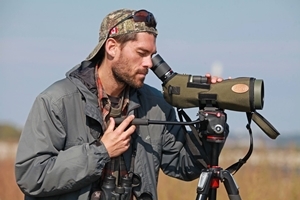 Journal of Field Ornithology 57: 114-125. https://sora.unm.edu/sites/default/files/journals/jfo/v057n02/p0114-p0125.pdf. Sibley, D.A. 2014. The Sibley Guide to Birds. 2nd ed. New York: Alfred A. Knopf.